17. 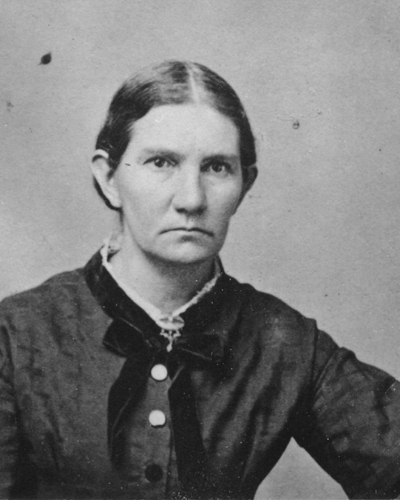 Mary Ann3 Cox (Joseph2, John1) was born 9 April 1824 in Indiana, presumably in Wayne County. She died 21 October 1909 at Burwell, Garfield County, Nebraska, the last survivor of the children of Joseph and Mary Cox. Mary married William Calvin Freeland on 11 May 1848 at her father's house in Hampton, Rock Island County, Illinois. They were divorced in 1884 in Rock Island County (File No. 2473). William was born on 20 Feb 1824 in Indiana, a son of Luke Freeland and Ruth Thompson, and died on 7 May 1916 at Nagle, Missouri. He married, second, Annie _______. In the 1850 census, William and Mary Freeland and daughter Helena were living next to the household of Augustus Cox, which included the Mary (Rue) Cox, in District 37 (Hampton township). William had property worth $100. In the 1860 census, W.O. [sic] and Mary A. Freeland lived in Zuma township (T18N, R2E), P.O. Hampton, in Rock Island County. W.O. was a farmer with real estate worth $2000 and personal estate worth $890. Truman (age 8) and Maria (age 6) were attending school. William C. (listed as a farmer) and Mary A. resided in Hampton township in 1880 (p. 330A). Their daughter Ella and son-in-law Alexander Zeigler were the next household. Mary sued for divorce in December 1883, stating that she and William Calvin Freeland had no money or property at their marriage, except perhaps 40 acres, and had since acquired a large amount of real estate in the townships of Hampton, Zuma and Port Byron and that her husband was considered a well-to-do farmer. Mary later moved to Nebraska and lived with her son Truman. She sent a letter to the first Cox reunion in ____. Mary is buried in the Willow Springs (Banner) Cemetery, at Burwell, Nebraska, in an unmarked grave, which is lot #2 in the Freeland plot (block 33 south) (S132).